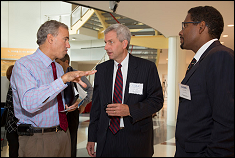 UM CERSI Co-Director Dr. William Bentley (middle) and Clark School Dean Dr. Darryll Pines (right) speak with FDA Chief Scientist Dr. Jesse Goodman (left). More progress is needed in science to improve regulating drugs and medical devices by the Food and Drug Administration (FDA), according to a diverse group of speakers at the first conference of the University of Maryland’s new Center of Excellence in Regulatory Science and Innovation (CERSI), on Sept. 5. Over 150 government, industry, and academic representatives came to College Park for the first CERSI Day, the annual showcase event for the new center. Funded by a grant from the U.S. Food and Drug Administration (FDA), the CERSI is a collaborative initiative between the University of Maryland College Park and Baltimore campuses that focuses on the science of developing new tools, standards and approaches to assess the safety, efficacy, quality and performance of FDA-regulated products in an effort to help modernize and improve the ways drugs and medical devices are reviewed and evaluated. The investment is part of the FDA’s effort to foster a robust, collaborative, regulatory science culture that enables FDA to address the scientific challenges presented by revolutions in medical product development, according to the agency’s website. The CERSI Day event featured a welcome and introductory overview from the center’s co-directors, Dr. William Bentley, chair of the Fischell Department of Bioengineering within the A. James Clark School of Engineering at the College Park campus, and Dr. James Polli, professor and Ralph F. Shangraw/Noxell Endowed Chair in Industrial Pharmacy and Pharmaceutics at the School of Pharmacy, based on the Baltimore campus. The remainder of the program featured talks from FDA Chief Scientist Dr. Jesse Goodman and industry representatives, including Dr. Robert Conley of Eli Lilly and Company, Dr. James McElvain of Kythera Biopharmaceuticals, Dr. Jack Cook of Pfizer, and Dr. Steve Castellino of GlaxoSmithKline. CERSI Day also featured poster presentations by University of Maryland researchers. The event was made possible by support from the FDA and additional support from CERSI Industrial Consortia member organizations, including AdvaMed, Becton Dickinson, Lockheed Martin, MDMA, SAIC, Siemens, and Weinberg Medical Physics, LLC. "Modernizing the science of how products are developed and evaluated is a complex challenge requiring teamwork," said Dr. Goodman in his opening comments. "The CERSI idea -- bringing together academia, the FDA, and also providing a place where industry can be part of that equation -- is really important because this isn't something we can do alone. The system and problems are too complex. We're faced with revolutions in science that provide new challenges and opportunities, and I'm very optimistic that people working together can take advantage of these opportunities to improve health." The intellectual origins of CERSI, said Goodman, are sophisticated modern sciences, including rapidly emerging areas like genomics, tissue engineering, bioinformatics, and other technologies that can be integrated into the testing and evaluation used to develop and regulate new products to better protect and promote health. Cook said the FDA’s current regulatory process will not solve the problem of ever increasing multidrug resistance among infectious bacteria, coupled with a steady decline since 1983 in laboratories developing and manufacturing new drugs to fight them due to high costs. Regulatory adjustments are also needed to meet "challenges in developing (medical) devices," said Conley. "I wanted to meet with you all because (CERSI) sounds like a great idea," Conley said, adding that product development interaction with the FDA is still very uneven. "As a manufacturer, how do we tackle the inefficiencies?" he asked. "And as a physician, I want to move our patients past oral ingestion and injections but more sophisticated devices are not very advanced at this time." CERSI includes faculty researchers from the UM’s Baltimore and College Park campuses. "We’ve had great progress in our first year"
Bentley announced that so far seven companies have joined a new CERSI Industrial Consortia program. "This is a partnership to enlighten industry on how the FDA works and to enlighten the FDA on what industry expects. It also brings all partners together to guide the center’s research agenda," said Bentley, adding that the CERSI conference was the first of many to come. Polli announced new training and work exchange programs for both university and FDA scientists. "We’ve had great progress in our first year," said Polli. Castellino suggested new medical imaging technology for drug development scientists and regulators. He proposed a MALDI- imaging system that combines the use of biological and chemical imagery that can reveal the effects of a drug on tissue and offer a distribution of where in the tissue a drug is doing the job for which it is designed: to affect a medical condition. McElvain spoke about the need for FDA guidance on good manufacturing practices during early clinical research. He said companies sometimes adopt excessively high standards, making early research too expensive and slow. To pave the road to a new regulatory paradigm, CERSI will fund four 10-month Innovation Awards of $50,000 each to faculty to research improving pre-clinical assessments of safety and efficiency, ensuring readiness to evaluate better technologies, and harnessing data to improve health outcomes. CERSI is also funding "America’s Got Regulatory Science Talent," a new competition for students at the UM Baltimore and College Park campuses. The aim is to promote student interest in the sciences of developing new tools, standards, and approaches to assess the safety, efficacy, quality, and performance of FDA-regulated products. Abstract: Drug delivery is the method or process of administering a pharmaceutical compound to achieve a desired therapeutic effect. Drug delivery technologies can modify a drug’s absorption, distribution and elimination for the benefit of improving product efficacy and safety, as well as patient convenience and compliance. Drug release is from: diffusion, degradation, swelling, and affinity-based mechanisms. Many medications such as peptides, proteins, antibodies, vaccines and gene based drugs, cannot usually be given orally because of enzymatic degradation or due to molecular size. For these reasons many drugs have to be delivered by injection devices. Ideally patients or lay caregivers controlling these devices themselves are the preferred method of delivery of chronically dosed medications. Current efforts in the area of drug delivery also include the development of targeted delivery in which the drug is only active in the target area of the body and sustained release formulations in which the drug is released over a period of time in a controlled manner. This is active field of therapeutic development. There are many evolving issues in the approval and monitoring safe uses of these technologies. This talk will cover some of the current hot areas and begin a dialogue on how the pharmaceutical industry, academia and the FDA can partner in the safe advancement of the field. Abstract: The International Consortium on Innovation and Quality in Pharmaceutical Development (IQ Consortium) is an association of about 30 pharmaceutical and biotechnology companies aiming to advance innovation and quality in the development of pharmaceuticals through scientifically-driven best practices and standards. The presentation will describe the scope, key objectives and the activities of the WG since it began in May 2011. Activities of the past year have focused on developing a series of position papers where it was felt additional clarity in GMP expectations would add value. The papers represent industry positions on best practices in four areas: Analytical methods, Specifications, Drug Product Manufacturing and Stability. The intention of the papers is to stimulate discussion and build alignment with internal stakeholders and regulatory agencies. Abstract: Despite the major threat multidrug resistant Gram-negative pathogens pose to patients worldwide, the conventional paradigm for the development of drugs against these pathogens is generally ineffectual. A proposal for innovative development programs that involve implementation of a graduated approval process is offered as a more feasible alternative. Similar development paradigms could also be applied to stimulate research for therapies in rare diseases. Abstract: Understanding the distribution of a drug and its metabolites is an essential element in the development of safe and efficacious drugs. The use of radio-labeling methods for characterizing drug distribution suffers from the inability to differentiate between parent drug and metabolites. MALDI Imaging Mass Spectrometry (MALDI IMS) is an emerging technique which can determine the spatial distribution of a drug and its metabolites in ex vivo tissue samples without the need for labeling techniques. Furthermore, this methodology allows the correlation of analyte tissue distributions with histology images and thereby integrating chemical structures with biological features. This presentation gives an overview of our efforts to couple MALDI IMS and histology in drug development to gain mechanistic insights into drug correlated toxicities and efficacy.